Home › Seahawks › #8: Can You Hear Me Now? The next day of 12 Days of the 12th Man, nwsportsjunkies brings the noise. 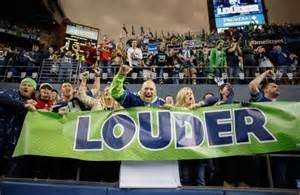 CenturyLink Field and the 12th Man have long been heralded as the loudest venue and fans in the NFL. In fact 12th Man broke the Guinness Book of World Records mark for loudest crowd roar at a sporting event twice this season! The initial world record was set at CenturyLink Field week 2 vs the 49ers at 136.6 decibels. This mark only lasted a few weeks before it was bested by the Kansas City Chiefs fans, putting the mark at 137.5 decibels. The fan group, ‘Volume 12’ which is led by former Seahawk player Joe Tafoya pushed to get the officials from Guinness Book of World Records back one more time, and they returned in December for the Monday Night Football matchup vs the New Orleans Saints. The 12th Man did not disappoint, breaking the record again and regaining the title of the loudest fan base in the NFL at 137.6 decibels. 137.6 decibels… That sounds pretty loud, but just how loud is it? Take a look at the chart below… It’s only a matter of time before #Louder becomes #WhatICantHearYou. Here are some interesting numbers, collected from a variety of sources, that help one to understand the volume levels of various sources and how they can affect our hearing.